Ohm64 Backlight Control from Livid Instruments on Vimeo. It’s been a long time since I touched Livid’s VJ software. But when it comes to hardware, they’ve been doing unbelievable work that could have Resolume and VDMX and Processing and vvvv and Max users turning their heads. The Ohm64 looks simply fantastic. It’s got an ideal configuration for a lot of live visual applications, with 8×8 triggers and plenty of faders and knobs to go along with them. It’s also finally a controller that’s well-made but doesn’t cost a fortune – you get a well-crafted device made by the people who designed it in Texas, but at $599, it’s still affordable. For visual software increasingly using OSC, a future firmware update should provide native OSC support (and possibly even DMX in the near future). For everything else, there’s MIDI support now. 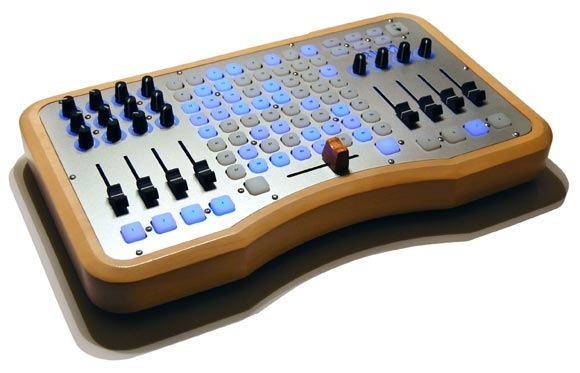 And unlike the Akai APC40, that means real MIDI support, with actual MIDI in and out ports and endlessly customizable controller assignments and LED feedback, instead of the Akai’s single USB port and permanently-fixed layout. And this is fully bus-powered, so you’re not screwed if you forget your power brick. I did a full preview for CDMusic. But next week I should get to try one in person, which is the real test.